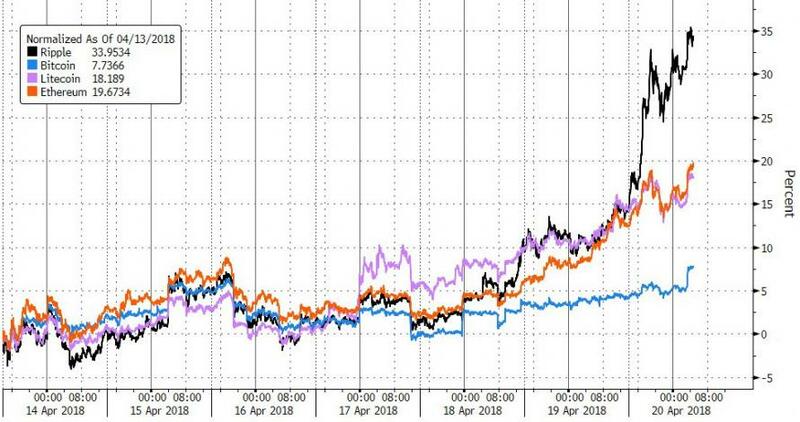 Crytpocurrencies are continuing their post-tax-day gains with Bitcoin above $8500, Ethereum at almost $600, and Ripple up over 30% on the week. Certainly for now, the anecdotal performance suggests Tom Lee's tax-based-selling these is playing out with strength continuing, but, we also note that The Sovereign Investor believes the most important crypto indicator just turned bullish. As the crypto asset class evolves, similar patterns and indicators used by traders in other asset classes are emerging. Investors are either willing to take on more risk through buying riskier assets, such as tech stocks with little to zero earnings; or they are looking to take less risk, adding either gold or U.S. Treasurys to their portfolios. As the oldest and most liquid crypto asset, bitcoin is considered “digital gold.” It can be exchanged for more altcoins than any other crypto and serves as the main entry and exit point to fiat currency. On top of that, there are thousands of merchants that accept bitcoin as payment, providing users another exit to the crypto markets. Bitcoin has been able to maintain crypto hegemony even through significant faults: Transaction speeds are much slower than rivals, and fees tend to skyrocket when the network is busy. Many contenders have tried, but none have successfully replaced bitcoin atop the crypto throne, and it remains the “store of value” within the crypto asset universe. This unique position allows it to outperform other crypto assets when investors are moving away from risk. As the crypto asset class evolves, similar patterns and indicators used by traders in other asset classes are emerging. This unique position allows it to outperform other crypto assets when investors are moving away from risk. To get a better understanding of investors’ willingness to take on crypto risk, it’s possible to analyze bitcoin’s relationship to other competitors. The second-largest cryptocurrency after bitcoin is Ethereum, which commands a $50 billion market cap, or about one-third that of bitcoin. Ethereum provides decentralized computational power, which can be provisioned to build and execute smart contracts. You can think of Ethereum as a smarter, programmable version of money. The computers responsible for processing and validating these computations are paid in ether, the native digital asset to the Ethereum blockchain. In the past year, over half of all new blockchain-based projects were based on the Ethereum blockchain. These are extremely speculative projects called utility tokens, and investors assume more risk when they trade their bitcoin for this new token, usually through Ethereum. If bitcoin is considered the “flight-to-quality” crypto asset and Ethereum represents more risk-taking, it follows that the Ethereum/bitcoin (ETH/BTC) spread should indicate how much risk investors are willing to assume in the crypto markets. A similar condition exists in the fixed-income markets, where most products are priced at a spread to U.S. Treasurys. When investors bid up the price of riskier assets, such as high-yield bonds, the spread between those bonds and U.S. Treasurys will narrow. However, when investors are less willing to take risk in the fixed-income markets, the same spreads will widen. Let’s take a look at the historical relationship between Ethereum and bitcoin. The following logarithmic chart shows ETH/BTC dating back to early 2017. You’ll notice that ETH/BTC began 2017 around 0.0081 and then peaked at 0.1500 in mid-June, which is about an 1,800% rally. 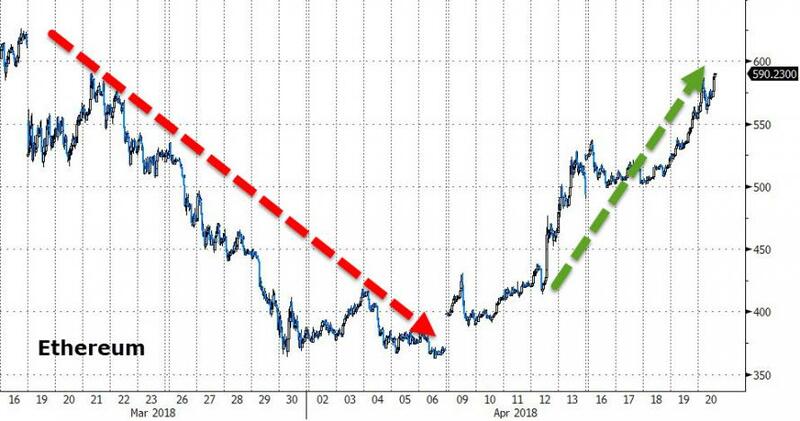 At the same time, the total crypto market space moved up from $20 billion to $115 billion, or a fivefold increase. 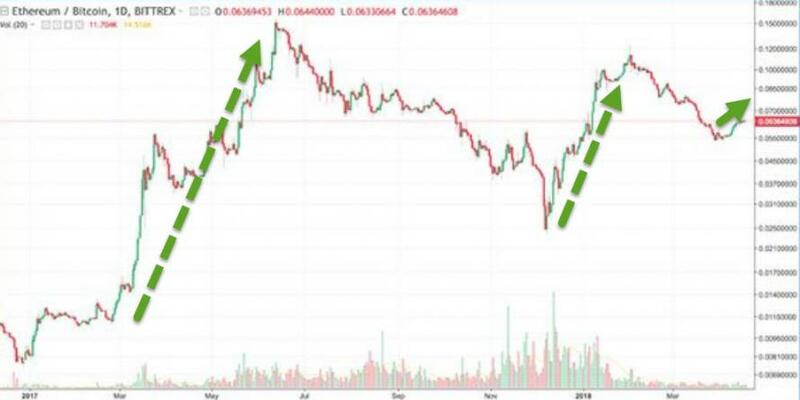 The next significant ETH/BTC rally began in December 2017 at 0.024, where we saw an increase of nearly 300% to 0.12 in early February 2018. During these months, total crypto market cap rose from $300 billion to an all-time high of $800 billion. Since this recent peak, both the total crypto market cap and the ETH/BTC spread have dropped significantly. The ETH/BTC spread has recently rallied 20% from 0.053 to 0.063, and the total crypto market cap rose 40% from $250 billion to $330 billion. It’s hard to predict the future. However, most markets give us an indication as to whether or not investors are willing to take on more risk. For instance, stock traders look at the CBOE Volatility Index (VIX), and fixed-income traders will look at the spread between high yield and U.S. Treasurys. When the VIX is low and bond spreads to Treasurys are narrow, investors are willing to take on more risk. In the crypto markets, it appears that the most common “risk on/risk off” indicator is the ETH/BTC spread. 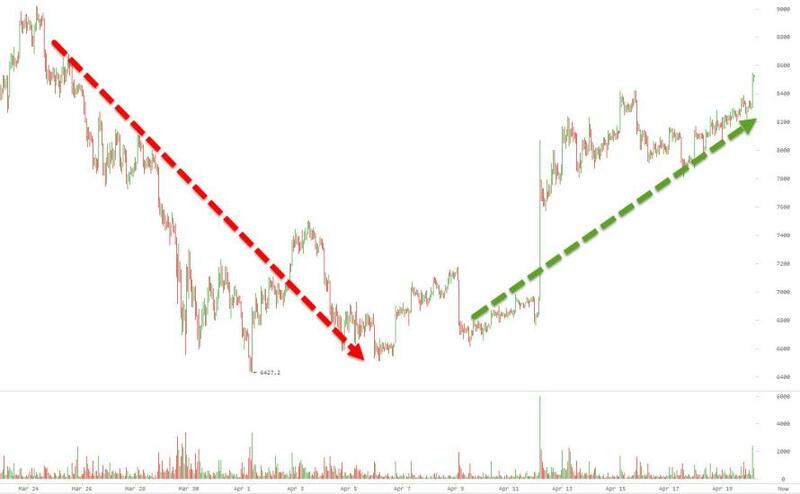 The recent rise in this spread might be a harbinger of good things to come for crypto investors.